This is just a quick little post. 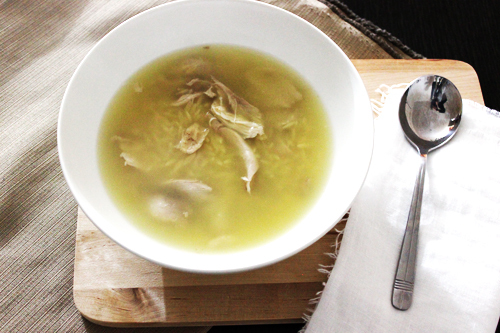 I wanted to include my recipe for a really simple and tasty chicken soup - the kind of soup that makes you feel better when you're having a rough week. I made this Sunday afternoon while watching long awaited episodes of Gossip Girl - after a busy morning, I felt like nothing more than watching cheesy drama with amazing fashion. I threw some things in a pot, turned it on then walked away for 3 hours. My kind of soup. I've been eating this soup for as long as I can remember. When I was a little girl and my mum would ask me what I wanted for dinner it would always be "pastina!". She always cooked Stelline, which is the little stars, because it was my favourite. I haven't found them lately, so I just use Risoni instead. Place the chicken, celery, carrot and onion in a large pot and fill with water. Add a few chunks of rock salt and bring the pot to the boil. When boiling, turn down to a gentle simmer, cover with the lid, and leave for 2 - 3 hours. The longer you leave it, the more flavour. While the stock is cooking, skim off any excess oil and impurities and discard. When the stock is ready, allow to cool slightly before removing the vegetables and chicken. Discard the vegetables. Remove the chicken meat from the bones and set aside. Discard the bones and gristle. Pass the stock through a sieve and or muslin cloth and return to the pot. Bring the stock back to the boil, then add the pasta. When the pasta is cooked, add the chicken. Check for seasoning.